Chenonceau’s opening hours are long but its popularity make early morning and late afternoon the best times to see the chateau. Château de Chenonceau claims to be the most popular privately owned monument in France. It is also the second most-visited chateau in France, only behind the Palace of Versailles. High visitors numbers are no empty claim but the absolute beauty of Chenonceau makes the palace still a must-see even during the high season. The chateau is open every day of the year making it sensible to try and avoid the main season. However, even on weekends and summer holidays, the chateau can be enjoyed by visiting early morning or late afternoon. Chateau de Chenonceau is open every day of the year including Christmas and New Year’s Day. On some vacation days, opening hours are even extended. Opening hours jump around according to the time of the year (and light conditions). The minimum opening times are 9:30 to 17:00 from mid-November to mid-February. 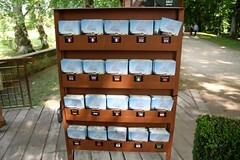 In July, the chateau and gardens are open from 9:00 to 20:00. Last admissions are half an hour before closing time but leave at least an hour, and more likely two hours, to explore the chateau and gardens. During the summer, it is also possible to visit the illuminated gardens of Chateau de Chenonceau at night. Nighttime promenades are possible every night in July and August as well as Friday, Saturday and Sunday nights in June. The gardens are open from 21:30 to 23:30. Admission is €5. During July and August, it is often possible to rent rowing boats at Chenonceau to inspect the gallery from the river. 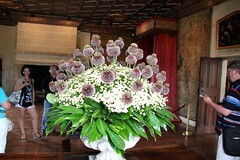 See Chateau de Chenonceau official site for opening hours. The easiest way to avoid the crowds – and this fairly small palace do get unpleasantly crowded at busy times – is to avoid visiting during the high season. Chenonceau is particularly busy during the summer season (July and August), most school holidays, weekends, and particularly over long weekends. Visit first thing in the morning – this usually works for Chateau de Chenonceau, as Chenonceaux is a small village not close to major towns or cities. Day-trippers and especially tour bus parties tend to not arrive during the first hour of opening time. Visit during lunchtime – tour groups usually do not visit between around noon and 1 pm, but families may. Visit late afternoon – probably the best option is to visit late afternoon during the final two hours of opening time. Day tours rarely visit Chenonceau late in the afternoon even though light is often optimal then for the best photographing of the chateau and the gardens. Château de Chenonceau is a beautiful site and worth visiting even when crowded. The suggested plan for visiting the chateau is not compulsory making it easy to revisit busy rooms or to first visit ones that are less crowded. However, the palace itself is fairly small making it worth trying to avoid the busiest times of the day.